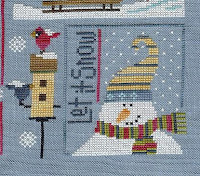 Here are a couple more quick stitches....well, the Pine Mountain Snow Brr-ds took a little more than 'quick', but still these are nice to fill in when working on larger pieces. Excuse the wrinkles....it's soft flannel that didn't stay flat on the scanner. I need to stuff it now with a small pillow. This one is Shepherd's Bush Santa's Fill. Also came with the Jill Rensel mats. Going to raid my stash to see if there are any more quick ones I'm wanting to do before going back to my WIPS. 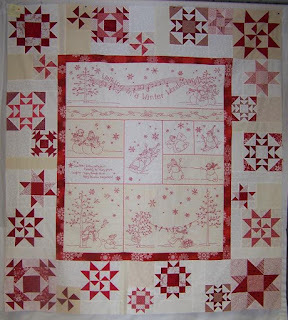 I loved doing this quick little Shepherd's Bush kit called Merry Day. It came with the Jill Rensel handpainted mats. 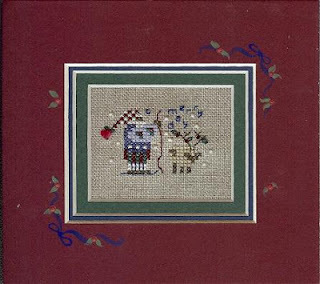 Up next to continue my break from a couple of larger projects is another SB kit and a pine mountain pillow kit. and here is the whole piece....done on a piece of blue I had in my stash with no color name on it. I still need to attach the buttons. I finally got around to closing up the last seam and attaching the ribbon to my long finished Halloween Quadrille. Just in time to display it for the last few weeks before Halloween. 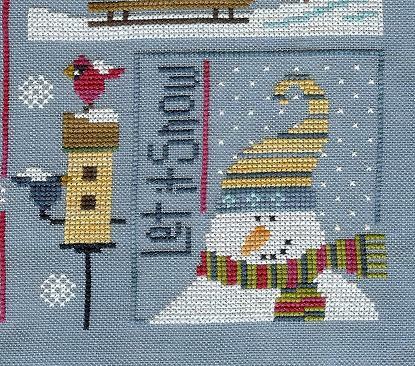 I am NOT ready for the real thing here...but it sure is fun stitching Snow & snowmen. 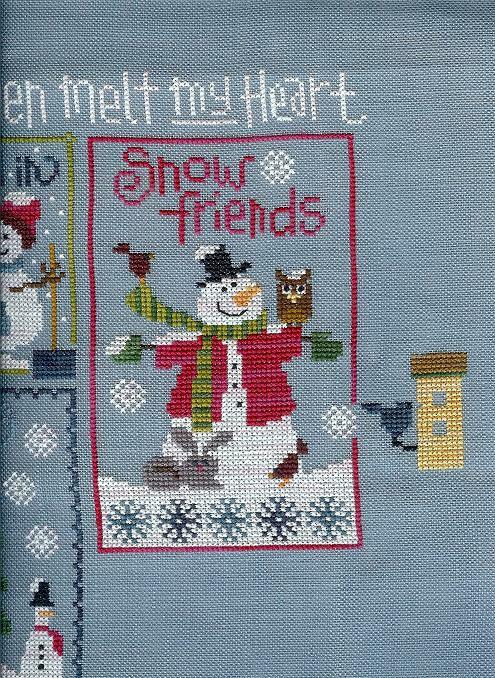 Here is part 5 of Lizzie Kate's 6 fat snowmen with the chart extra part stitched also. 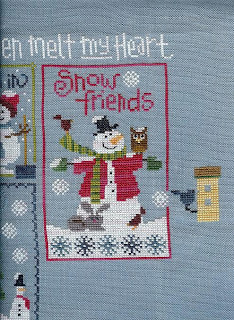 I'm on the last snowman then hopefully on to the last 3 SnowBelles with something else stitched in between as I won't pick up those charts till later in the week. 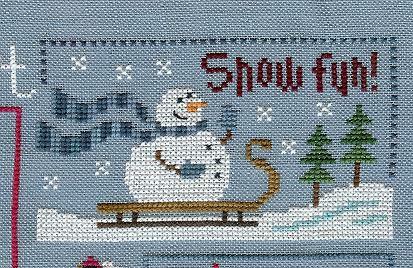 Hmmm what to stitch next? 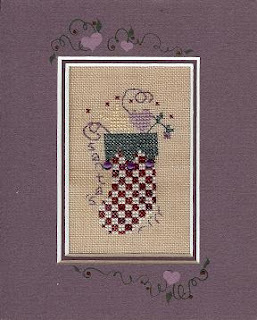 These are so fun and so quick to stitch( it helps to be a hunting widow on the weekends) although, who am I fooling, I get just as much stitching done when he is home. 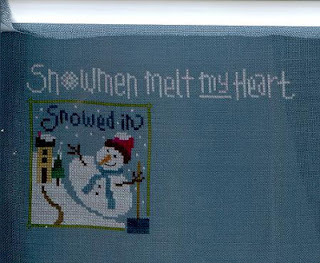 LOL I finished this yesterday and have a good start already on the next chart. Hopefully I will get to pick up the next 3 snowbelles to finish that one up as soon as this series is done. Have season 2 of Downton Abbey to watch....family is out and about this weekend so good tv & stitching time for me. 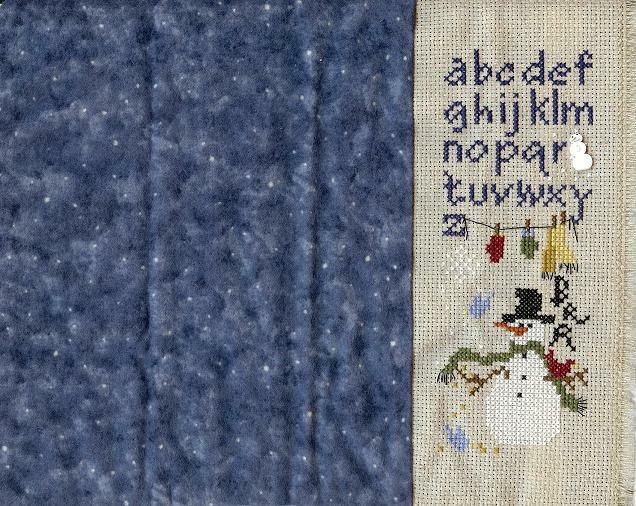 Last year I embroidered snowman blocks from Crabapple Hill Winter Wonderland. Here are the blocks my mom set together and I just recently finished the turkey stitch in between each block. 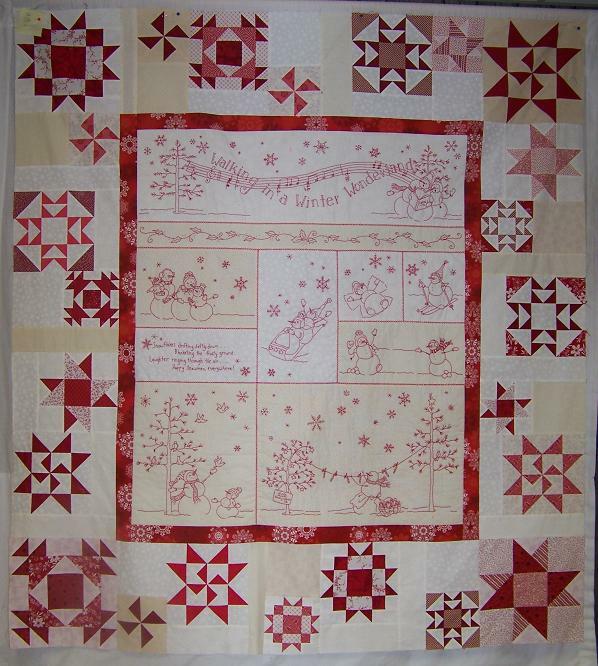 And now here is the quilt with the outer blocks set in. 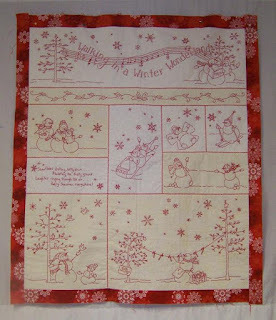 Next up Mom will put the binding & backing on then will quilt it. Here is the 2nd chart of the Lizzie Kate 6 fat men series....Snow House. 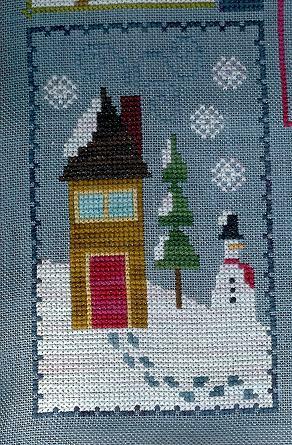 Oops....I see I need to add the couple of backstitches on the windows....oh well, will be a complete finish in a few moments. Snowflake buttons to be added at the end, which also reminds me I need to find some more of them....They aren't JABCO buttons, at least they aren't in their catalog. It's been a bit nippy here and even so much so that some rain we got last weekend had some sleet in it....ugh...too soon for me. It's supposed to be warmer today and later in the week which will be a nice reprieve. 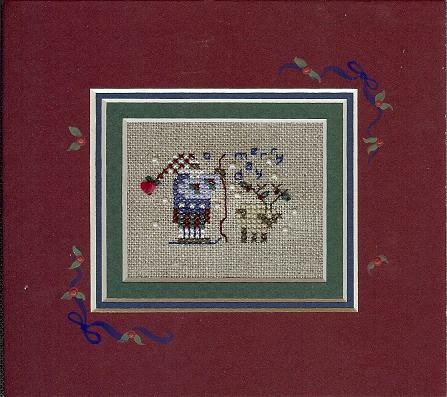 Here is the first of the 6 Fat Men from Lizzie Kate. I'm using a piece of blue 32 ct. linen I had on hand(it's a little more grey blue than this photo shows....again, I'm using W snowflake for the white.